Our cast iron test weights undergo a special phosphatizing process in which the metal is thoroughly cleaned and mildly etched to allow exceptional finish adhesion. The weights are then coated with a layer of chip-resistant paint which conforms to NIST Handbook 105-1 standards. This two-step process ensures a long-lasting finish that greatly reduces the possibility of corrosion. 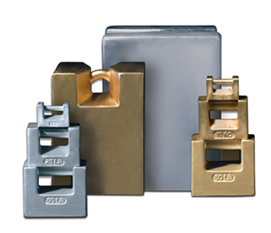 All cast iron test weights are traceable to the National Institute of Standards and Technology (NIST). To verify adherence to class tolerances, optional traceable certificates are available. Weights are manufactured to one of the following specifications: ASTM E 617, NIST Handbook 105-1, or OIML R111.